The cold and flu season is nearing rapidly. If we get a cold where we have stuffy noses, or coughs, I want to be ready. In the past, I would use the OTC name brand vapor rub to help relieve symptoms.Of course, after learning what the ingredients in the OTC rub were, I wanted to avoid that like the plague. I mean, really, why do you need paint thinner in there?? I figured though, I make other stuff, why not this? So, after a bit of trial and error, I came up with my own diy decongestant rub. because when my kids were little, and my mother still with us, if they got a stuffy nose, she would put a bunch of vapor rub on a tissue for them to smell the vapors in as they wanted. Ah, memories. This stuff is great because it works just as well, and there is no questionable ingredients. 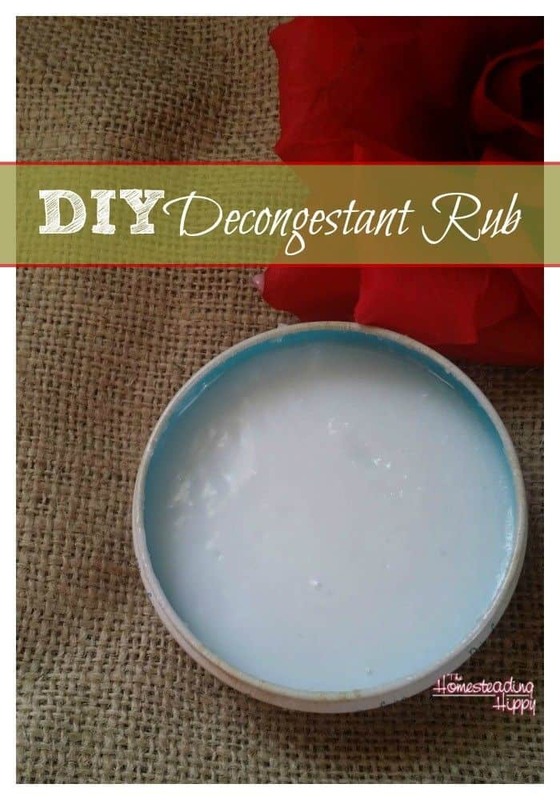 So, without further ado, here is my DIY Decongestant Rub. Carefully stir the softened coconut oil with the essential oils until well blended. Store in a container like this or upcycle an old candy tin (like this-which is what I used here.) To use, simply rub 1/2 teaspoon on the chest 2-3 times a day. Even though it’s coconut oil, it’s still fairly easy to get out, even in colder conditions. If you find it’s too hard for you, simply rest the container in a bowl of warm water for a minute or two for easier use. Not for use on children under the age of 2. Oooo I’ll have to try this! i’ve been thinking about doing a vapor rub this winter and love an all natural version even better. Thanks for sharing! Hi Jill and thanks for stopping by! I love this so much! I cannot wait to try it.